Recovery is possible at any age and any stage post-stroke. If you’re worried that it’s been too long since your stroke for you to keep recovering, then prepare to make a serious paradigm shift today. Because the truth is that it doesn’t matter if it’s been decades since you stopped rehabbing. Your brain is always capable of changing and healing at any age. Studies have showed that your brain is capable of changing for your entire life through neuroplasticity, the mechanism that allows your brain to rewire itself. Neuroplasticity is activated through practice. Whenever you practice something, your brain becomes engaged and starts to grow and adapt itself to get better at the task. For example, London taxi drivers who have learned to navigate 25,000 streets have more brain cells growing in the part of their brain that is related to knowledge of maps. Similarly, medical students who have been studying for a medical exam have changes in their brain the areas that control memory retrieval and learning. These studies prove that your brain changes and grows in related areas whenever you practice something. For stroke survivors, this means that it doesn’t matter if it’s been two months or two decades since your stroke. Practice can spark new changes in your brain whenever you simply start to practice. Practice is the “magic pill” of stroke recovery. It can restore any stroke side effects that you have. Whatever you practice – from talking to walking to remembering – is what you get better at. You can restore all of your abilities after stroke through practice, practice, practice. As you get older, your brain’s ability to change slows down. It takes more practice in order to produce the same changes in the brain. But don’t let your brain’s negative bias cling to this information and forget all the rest. Instead, let’s hone in on the really good news here: Your brain is still capable of changing as you age. It’s capable of changing for your entire life! So don’t ever short-change yourself by assuming that it’s “too late” to pick rehab back up or that it’s been “too long” since your stroke and there’s no hope. There is tons of hope for stroke survivors of all ages, stages, and impairment levels. All you need is a dedicated practice and your brain will start to change for the better. One of our rehab tools, MusicGlove, is a hand therapy device that helps improve hand function by motivating lots of repetition (i.e. lots of practice). We had a patient try the device 24-years post stroke. She wasn’t sure if it could help her so “late in the game,” but she wanted to try it anyway. And guess what? Even after two and a half decades post-stroke, she improved her hand function significantly! Her story inspired us, and we hope it inspires you too. Your brain changes based on whatever you practice, and these changes are possible at any age and any stage post-stroke. 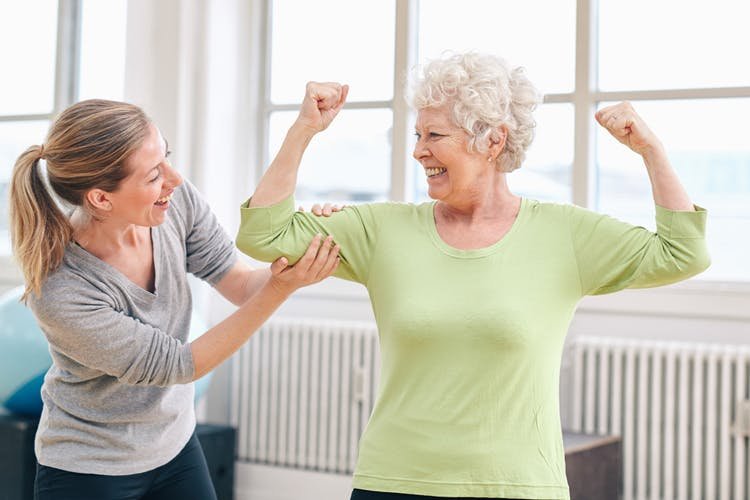 Even if you took a long break from rehab, you can still pick things back up and see results – even decades after stroke. Never give up and keep practicing! PS. If you want an extra does of motivation, check out our book Healing & Happiness After Stroke. It’s a stroke survivor’s guide to emotional healing and motivation during recovery.